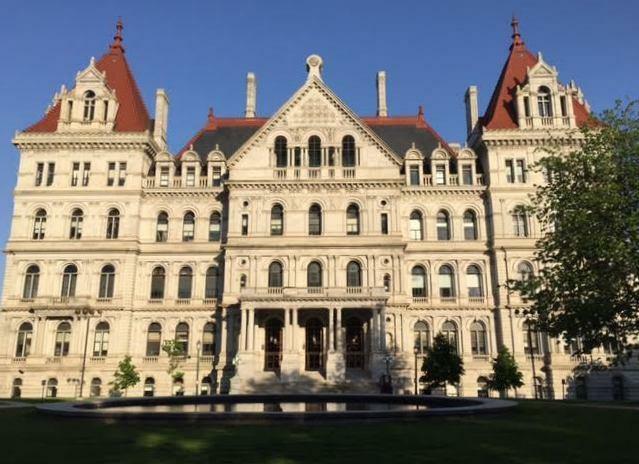 Monday marked the first day that the former breakaway Democrats in the New York State Senate were working with the mainstream Democrats after they agreed to reunify earlier this month. WBFO Albany Correspondent Karen DeWit reports. Democratic Leader Andrea Stewart-Cousins said so far, it’s all proceeding smoothly, but she dampened expectations that major new legislation would get done before the session ends in June. At the Senate’s first meeting since the holiday break, the official reunification of the Independent Democratic Conference and the mainstream Democrats was put in motion by Sen. Mike Gianaris on the Senate floor. Gianaris is giving up his post as deputy Senate leader to the former IDC leader, Jeff Klein, starting Tuesday. Klein had no comment on the changes. Stewart-Cousins, in an interview in her office, said the reunification with Klein is going well. The Senate Democratic Conference now has 29 seats to the Republicans’ 31. There is a 30th Democrat, Sen. Simcha Felder. Felder, who has more conservative views on many issues than most Democrats, prefers to meet with the Republicans, and for now will continue that arrangement. That gives the GOP the 32 seats required to form a majority in the chamber, although Democrats are lobbying Felder to switch his allegiance. Stewart-Cousins said Felder would be a “valuable member” if he chose to join the Democrats. There are two vacant Senate seats, and a special election will be held on April 24 to fill them. Democrats are favored to win both seats, and could have the 32 seats they need to form a majority. But if Felder does not join the Democrats, the GOP will keep control of the chamber until the session ends in early summer. Gov. Andrew Cuomo put a number of progressive issues into his state budget proposal, including early voting measures, reforming the criminal justice system to end cash bail and the Dream Act to give college aid to the children of undocumented immigrants. The GOP-led Senate rejected most of the items, and they did not end up in the final state spending plan. Senate Democrats and the former IDC members all support those measures, but Stewart-Cousins said it is not likely that they will be approved this year. She said after the special elections take place, there will only be a couple of dozen working days left in the session. “The agenda will be constricted because of the time frame,” she said. Stewart-Cousins said Democrats hope to gain more seats in November and approve the measures next year. Republicans, meanwhile, say they don’t expect there will be much disruption from the Democrats’ reunification in the remaining months of the session. Cuomo brokered the merger after he received criticism from the left in his party, who said he did not do enough to promote Democrats in the Senate. Senate Republican Deputy Majority Leader John DeFrancisco said the move was made solely to benefit the governor’s political fortunes. In an open letter released to the members of the state’s Democratic Party, Cuomo praised the reunification of the Democrats in the Senate, saying the “Democratic political world was revolutionized” and that the change will have “profound” long-term consequences.